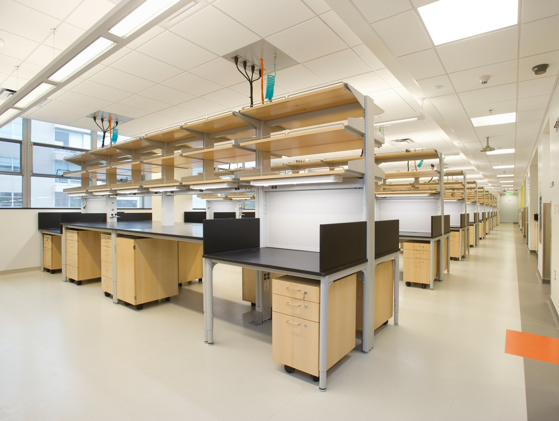 Anatomy Department Laboratory Renovation | Oculus Architects, Inc.
A phased laboratory renovation of approximately 9,000 s.f. The allotted area for this complex project was comprised of contiguous spaces spanning three linked buildings built at different dates on occupied floors shared with other departments. BIM and Lean construction methodologies were implemented throughout the project with sustainability goals and LEED targeting a top priority. The project was recently awarded LEED Silver certification. The program for this project sought to create a new research laboratory facility to accommodate three individual Principal Investigators with modular lab benching and desking for 36 persons.